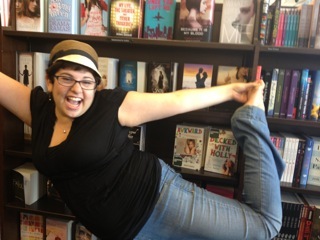 This entry was posted in Awkward, Book Review, Decked with Holly, Romance, Writing, YA Fiction and tagged Amazon, Bookalicious Pam, Goodreads, Teatime Romance, White Collar by Marni Bates. Bookmark the permalink. So I just read your interview from A Teatime Romance. I see that you mentioned a Susan Andersen book. I haven’t read all of Andersen’s books, but one of my fave romance novels is Perfect Danger. Have you read that one? It is not a new book, originally released in 2000, I think. But is is amazing. I would love to hear if you have read it. 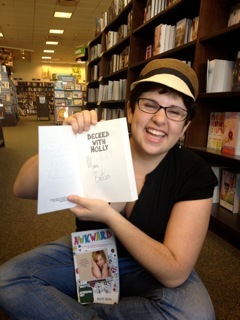 Also, loved Decked with Holly! Congrats! 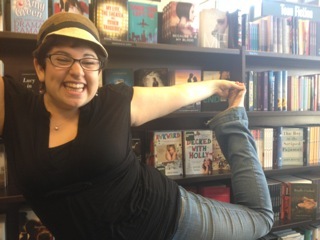 I saw it in my Barnes and Noble!! 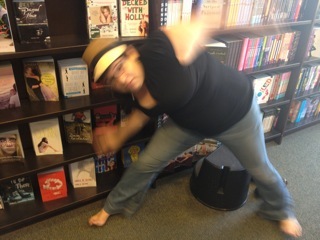 I dragged my mom over so she could see it on the shelf! Congratulations on your fantastic launch day! Loved your hilarious pictures and commentary. So much fun to read! Thanks, Caryn! I’m so glad you enjoyed my photos! 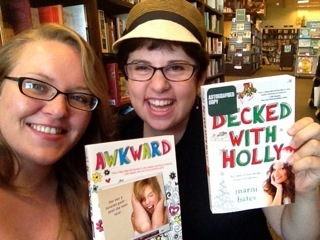 We definitely had a great time geeking out at Barnes & Noble. 😀 I can’t wait to hear what you think of the book! read the back and knew I had to try it out. After reading the first line I began giggling. My husband looked at me, smiled, and asked “already?”. I really enjoyed the book and loved your humor. Thank you! I needed another favorite author and now I can’t wait to see what you have next. Wow! Thank you so much, Deanna! You completely made my day. 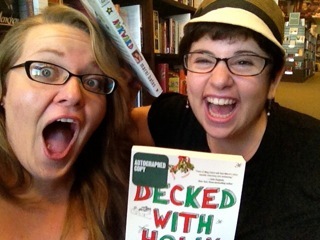 I’m absolutely thrilled to hear that you loved reading Decked with Holly! I loved every minute of writing it–especially the first sentence. 😀 It’s the spin-off sequel to Awkward, so you might want to backtrack and read that one next. That way you’ll be all caught up when the next book in the series (Invisible) is released. 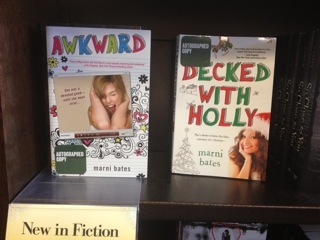 I hope you’ll let me know what you think of Awkward too! Again, thank you so much for your support and enthusiasm.